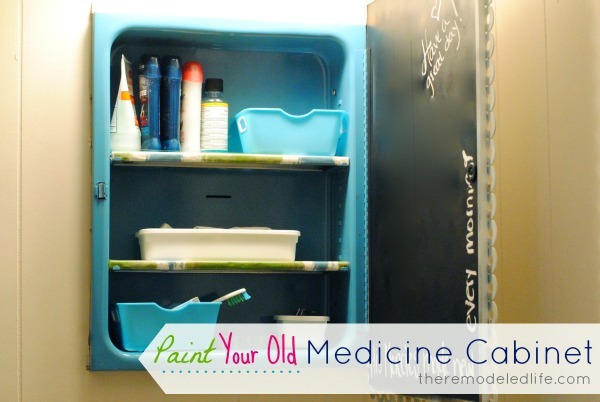 If you live in an older home you probably have an old medicine cabinet somewhere in your house. We had two - (now down to one after replacing the other with a pretty mirror). 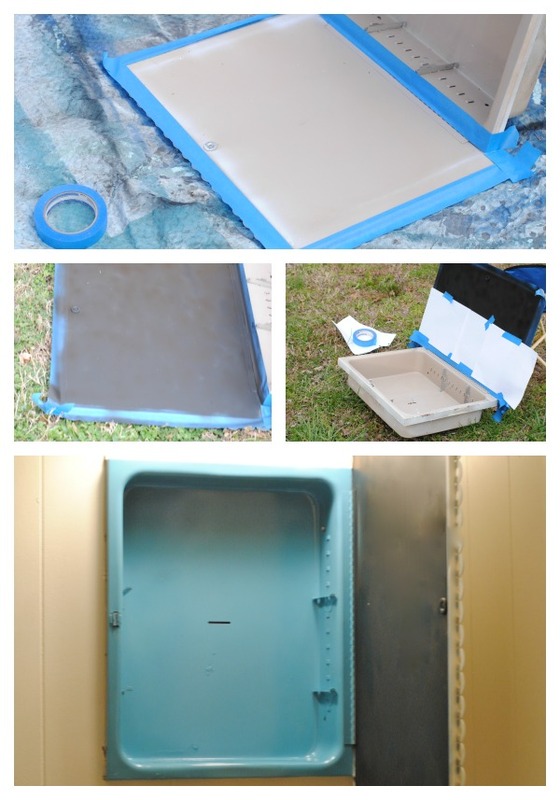 So, I've already updated the outside of our old bathroom cabinet using washers and spray paint and I finally got around to freshening up the inside. It was much needed as there was a little rust going on and just overall blah-ness. It just took a little time, some paint and fabric. 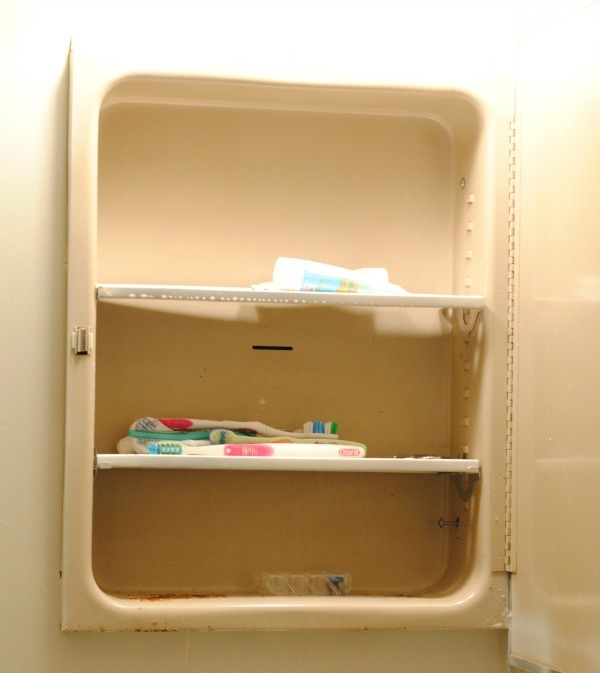 Here's the before cabinet - yucky I know. And, I have never really taken any time to organize it so things would just pile up in there. It was easy to remove the cabinet from the wall - I did it by myself just by unscrewing it. Once I had it out, I took it outside and taped off the part I wanted to paint. I decided to paint the door with chalkboard paint and paint the inside just a glossy teal - both which I already owned so I didn't have to buy anything new. After the chalkboard paint dried, I taped off the next section and spray painted it. Remember to just use nice light even coats. I used two coats on both sections. Next I re-installed the cabinet and decided to use fabric to cover the little shelves. I grabbed some leftover shower curtain fabric from our ottoman project and cut it to size. I used a little hot glue to hold it down on the shelves as I covered it and then covered the fabric a with clear cabinet liner to make it durable and wipeable. Just fabric would get ruined quickly. After that I just needed to add some little bins for organizing. I think I might go back and label the bins to just help with keeping it organized. So far its working just fine - actually much, much better than before. I love the addition of the chalkboard door for notes - I mean come on, I will paint anything with chalkboard paint. So here's the before and after - so much better right? And I just used things I already owned. 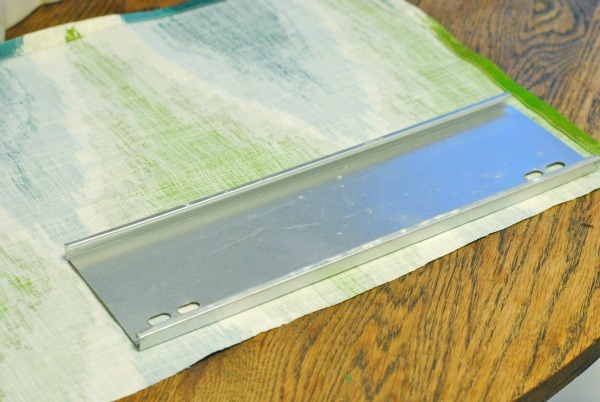 You really don't have to spend a ton of money to make some fun updates to your home. I love it when I can do something for nothing. Thanks so much for joining me today! Anybody else making some no-cost updates to their home? Share with me! What a great idea! It turned out so good! I would have never thought to do this! What a fun thing to make you smile in the morning! How fun! It would have never occurred to me to do this. Thanks for the inspiration! Ooo i like it! what a fun pop of color in the morning! Just found your blog & love it!! New follower on here and twitter! Would love if you followed me back. I'm over at lbinwonderland.blogspot.com & linwonderlandb. Thanks for the inspiration- your DIY looks amazing! Cute!! I love that you painted it. And that color is gorgeous. We've got one in every single bathroom of our house, I really need to do something with them. Darling! So much better with a little color! I'm visiting you today from Live Laugh Rowe. I hope you get a chance to stop by my blog and leave a comment and Link Up, too! It looks WAY better! Way to work with what you've got! 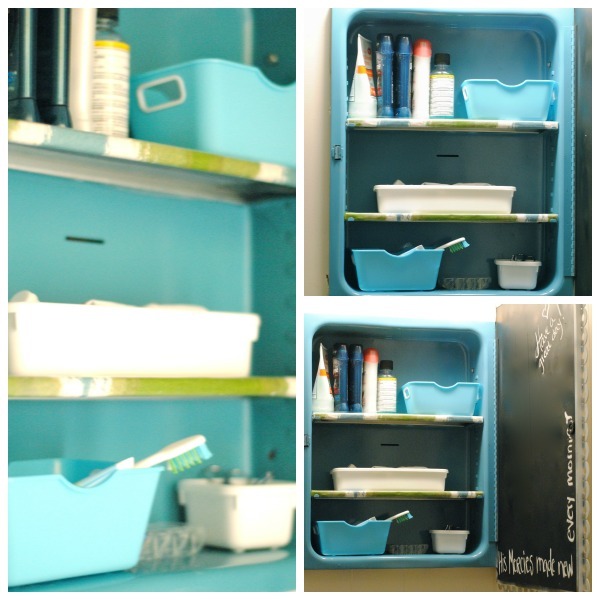 You can use magnets to hold things like tweezers and nail clippers on the back of thd door.